Cathie Gleeson, an instructor in our Tuesday morning prison quilting class, ventured out on the windiest day of the year to have two CCQ student quilts documented at the Oregon Quilt Project’s DocDay in Lake Oswego. Quilt experts at the event identified the blocks, fabric, and batting; measured each block, sashing, border, and the quilt overall; noted quilting patterns and techniques; and photographed the quilts. Information gathered at DocDay will be entered in the Quilt Index, a project of the Quilt Alliance. 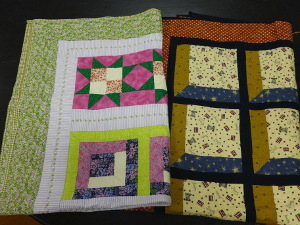 The database currently contains records on more than 80,000 quilts. Anyone can access this information 24/7 at no charge. Quilt historian Mary Bywater Cross encouraged us to have two quilts documented. The quilts chosen are representative of the hundreds of quilts made by women incarcerated at Coffee Creek Correctional Facility for donation to organizations throughout Oregon. Mary explained that the quilts don’t have to be of great value, antiques, or to have traveled the Oregon Trail. They merely need to reflect quilting in Oregon. She believes our students’ quilts qualify as a unique example of the value of quilting. We do too.